Our last day here in Algonac Michigan was actually the most moving day of the weekend. The show was done, the awards handed out, and the history lesson was over. It was just boating from this point on. Which of course is more of a history lesson into itself. I believe that history is in us as humans, not in buildings and or objects. 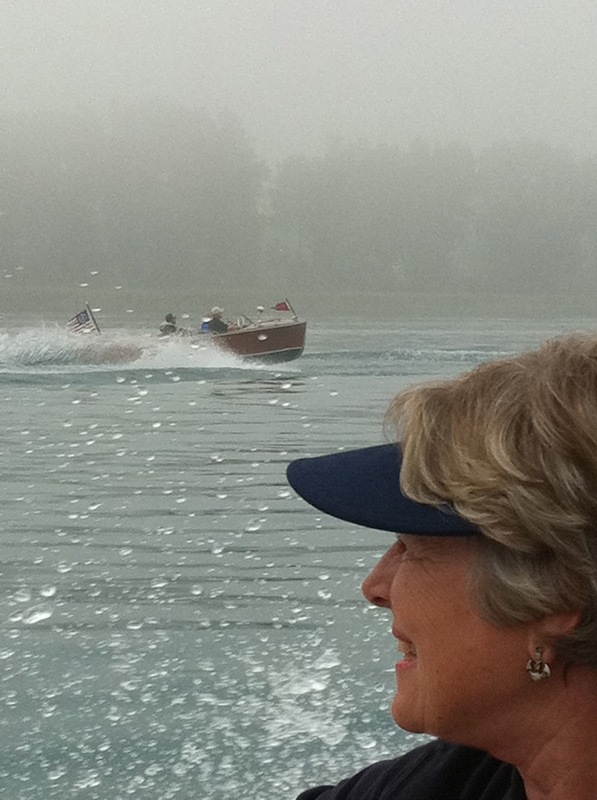 To be here and meet the families of the founders and the inspirers was a lifetime event for me and any motorized boat lover ….now feel it and understand it all just a tad more. One is never fully enlightened…. I have 1000 images of events and places since starting Woody Boater, but one can not shoot a picture and convey the emotion that took place today. I also have to point out, that today may have been one of the final acts that the original family owned Chris Craft company does. There was Herb Pocklington tireresly doing what he has always done.. Promoting the Chris Craft brand and its family. Bringing together rather than tearing apart, building, and trying to grow an idea, a vision.. a community. Seeing first hand how this has all come together, it’s no wonder that this company was so successful. I have seen this only a hand full of times as a marketing executive. You can feel companies that are strong and this company.. The one that was here today. The families.. Herb, Chris, the Woods the town, the area.. It is no surprise how and why we all wound up here, with a statue.. Herb, you deserve a big standing ovation from all of us…. I know it’s not your thing to get such praise. It’s never been your job or your passion to do anything for credit….. Your job was to promote others. Today, take it.. You deserve it. It’s how it all works. Great design, great product, great marketing.. It was all here today with the Wood, Smith and Pocklington families. I was honored to be here…..And very humbled to be able to be given access to share it with thousands of you on Woody Boater. OK.. You want pictures of boats.. OK OK OK.. boat pictures! You are so predictable.. So here goes.. Morning on the St Clair. Arriving at the Old Club. The nations oldest Yacht Club.. And yes I was wearing my HAT! Yes it looks just like 1947 here. I swear many of the shots from the original catalog days had to have been shot here. Ole Mr White.. No we are not going to change the name of the web site to Mr White.com But dang this boat just takes a great shot. Leaving the club.. There is Chris Smith coming out..
Is this a Chris Craft Ad or what. Herb at the podium about to start when one of the young Woods came up to speak. This was one of the more fun parts of the event. Young Master Wood here never really said munch but mmmm and ahhh, but to be honest, it was fantastic, he was up there with Herb in a spontaneous way to show us all that this was a family event first. Not the bronze or the corporations, politics.. non of that.. Just family..Only in a moment like this could an outsider like me understand how this all came together. Awesome. Thanks for going for those of us that can't. Is Chris's boat a Sea Skiff. Love those lapstrakes. There is often a Lyman floating near by.